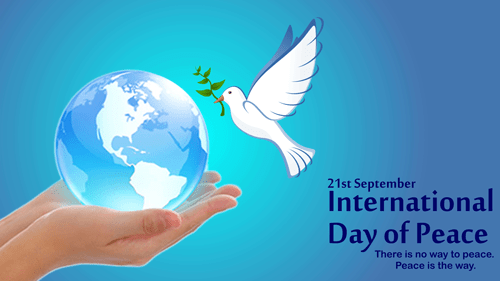 The United Nations General Assembly declared, in a resolution sponsored by the United Kingdom and Costa Rica in 1981, that the International Day of Peace be devoted to commemorating and strengthening the ideals of peace. The date initially chosen was the regular opening day of the annual sessions of the General Assembly, the third Tuesday of September. The United Nations was, of course, founded in the aftermath of World War II to prevent another such conflict. Obviously there has not been another world war, but the body has not been especially effective at preventing smaller wars. The ineffectiveness of the UN should not come as any surprise, but, nonetheless, we can applaud the ideals. It can be admitted that the UN has been successful in a great many areas through its numerous organs such as WHO and UNESCO. The problem is that world peace is certainly a goal that I am sure the majority would support in principal, but the practice is endlessly elusive. This is because the causes of conflict are seemingly impossible to eradicate. There are many causes, obviously but I would like to focus on two: human temperament and profiteering. As a professional anthropologist I do not believe in some notion of universal human nature. All cultures are different, and some exist globally and in history, who seek/sought to live peaceably. Conflict is not in our natures; we learn it. In fact, a very good case can be made for the argument that genetically we incline towards cooperation. There’s also a good case to be made for the argument that prehistoric hunters and gatherers were peaceful people. It was the development of domestication and, thereafter, cities, that created the conditions for war. What little we can glean from contemporary foragers is that it is in their best interests to share and live at peace. Presumably that was also true in prehistory. Unfortunately prehistoric foragers lived in conditions that no longer exist. The most obvious ones that have vanished are abundant natural resources and low population. Under those conditions, when local groups grew too big to be sustained by local resources they could simply fission and move to new territory without conflict. That state of affairs is long past. 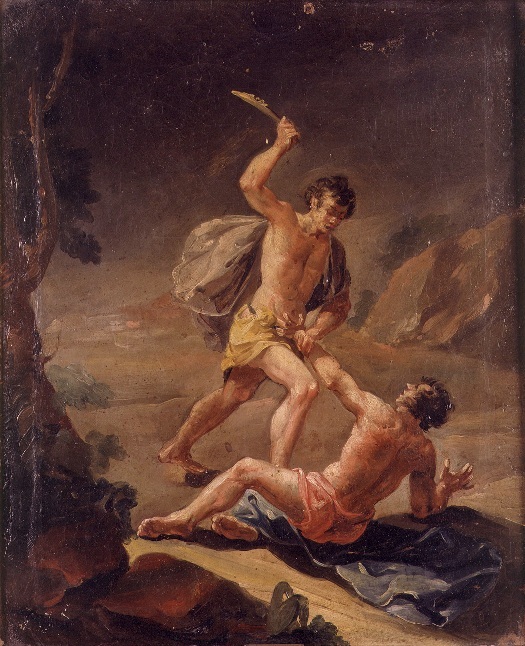 The Genesis story of Cain and Abel is probably a fair summation in parable form of the state of affairs in Mesopotamia at the time of domestication. Their parents, Adam and Eve, were simple foragers when they lived in the Garden of Eden. They lived off the bounty of the land. But when they were expelled they had to grow their own food by the sweat of their brows. Whether foraging or farming, people need both vegetable and animal products for survival (as a general rule). Foragers can provide both for themselves by dividing up the labor and then sharing their resources. With domestication comes a problem. It’s not as easy to create communities that can both farm crops and raise animals. Both activities benefit from the same kinds of land, but if there is not enough to go around disputes may arise. In Mesopotamia there was a simple solution to such disputes. Farmers could take the fertile river valleys and pastoralists (animal herders) could take the rugged hill country that was not useful for farming. Of course, the hills are not good for cows and pigs, but they are perfect for sheep and goats. Enter Cain and Abel. Cain raised crops and Abel kept sheep. With this division comes the need for trade: the farmers need meat and the shepherds need bread. One way to accomplish this is through peaceful negotiation. The other is to take what you need forcibly. Pastoralists have historically subscribed to the forcible course of action because they have the means at their disposal to be successful. They slaughter animals routinely, so they can turn the technology of death from animals to humans. In addition, they live in rugged highlands that are easily defended. 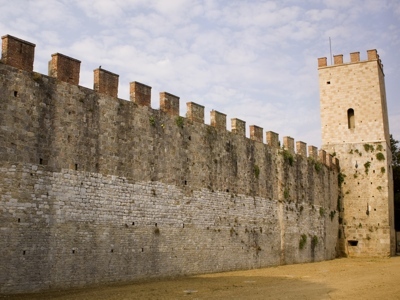 To protect themselves from such attacks, farmers need to build cities with walls and train soldiers for defense. And there you have it. Once communities develop with different interests you have the potential for conflict. Then as now the question is whether you are going to fight over resources or trade in harmony, and, then as now, fighting often seems to be the better option for one reason: profiteering. To put it in a nutshell, people have always gone to war to make a profit. Other factors come into play of course, but at heart someone is making a profit – always. If it were illegal to make a profit from manufacturing guns and bombs no one would do it. But the fact is that weapons manufacture is hugely profitable. At this point, if weapons manufacture were outlawed national economies would collapse. What is more, if weapons manufacturers ran the risk of dying through the use of their products, they’d run a mile. But that’s not the case. One group of people makes weapons and makes huge profits, and a different group of people uses the weapons and die. There’s the problem to be solved if you want world peace. As long as we live in a world where we’re content to let a small minority get fat at the expense of others, we’ll always have war. We need to beat our swords into ploughshares. My solution is in some ways simple, yet impossible to put into effect. Put the people who advocate war in the forefront of battle. If you want to make guns, you have to be the first one to put on a uniform and use them. If you want to declare war, you have to be on the front lines. I don’t doubt that conflict would cease instantly under those conditions. Eating together is, as I have said many times, one avenue towards peace and harmony. We’ve all had fights over the dinner table, of course, but in general sitting down together for a meal promotes goodwill. Some of my best times have come when circumstances required me to share a meal with strangers. I’d have no trouble filling a book with stories – passage from Australia to England sitting at tables for 14, a fish camp in the Appalachian mountains where everyone ate at one long table, hostel kitchens worldwide, barbecues in China, potluck suppers . . . the list is endless. Let’s talk about potlucks. Everyone brings a favorite dish and we all share. Perfect for a day dedicated to world peace. In the past my contributions ran the gamut from pies and pasta to creamy desserts. In the end I opted for bringing mounds of raw vegetables of all kinds with a dipping sauce because at every potluck there were oceans of casseroles and pies with not a vegetable in sight. My contributions always vanished in a hurry. My food suggestion du jour to celebrate the idea of world peace is to hold a potluck or something of the sort to bring people together to eat. 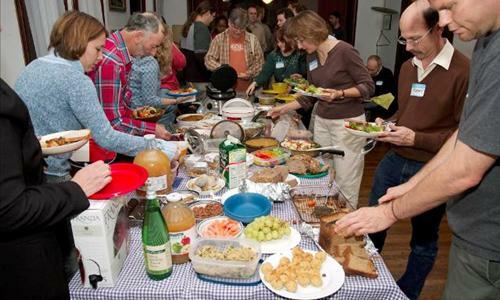 My favorite potlucks have been the multicultural ones where you wind up with one pots, curries, pastas and whatnot. So begin by imagining what you could make that would delight an international crowd. I’m spoilt for choice because I’ve lived in so many places and cooked so many different cuisines. Recently on this blog I showcased rice dishes as good for the masses. Here’s one I invented for a New Year’s potluck. It’s a burrito casserole. They all called it lasagna but loved it anyway. I don’t have a formal recipe because I made it up on the spot. You’ll get the idea. Start by sautéing an onion, chopped, over medium heat in a little olive oil, and when it has turned translucent add ground beef and brown it. Add a little powdered cumin also, plus salt and pepper to taste. I didn’t add any hot pepper flakes but I would have if it were just for me. When the meat is nicely browned add some crushed canned tomatoes and beef stock to moisten. Simmer for about 40 minutes until the sauce is reduced and thickened. In a separate skillet make a tomato-based sauce with crushed canned tomatoes, beef stock, and spices. Garlic and cumin are the mainstays, but you can add some others if you wish. Cilantro is a good addition. When the beef is ready, take out some flour tortillas. Make individual burritos by wrapping the tortillas around the beef to form a roll. Place the burritos in a row in the base of a baking dish. You can make one or two layers as you wish. Don’t make the burritos too fat because you want a balance of tortilla, meat, and sauce (like lasagna). Pour your tomato sauce over the burritos so that they are covered, with a little on top. 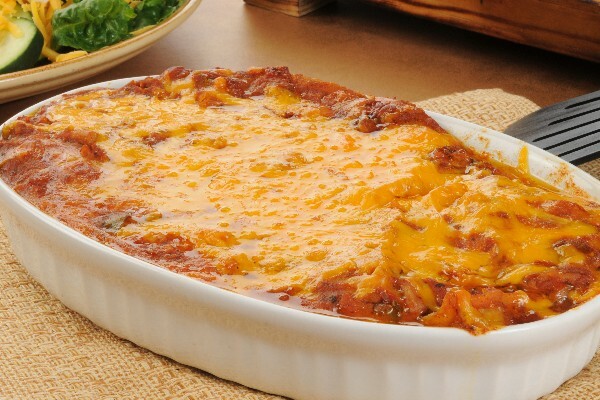 Cover the top with shredded cheese, and bake in a medium oven (300°F/150°C) until the cheese is melted and bubbling.